Preparation for the ABG 2015 General Election is in progress and the office does not leave any stone unturned. 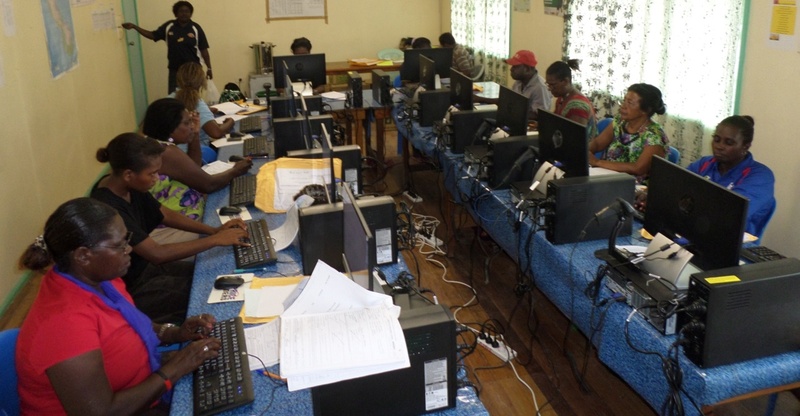 This morning the Electoral Rolls Data Entry exercise commenced and staff selected will start entering data into the system as of today and until the exercise is completed. A total of officers were announced over the weekend to go into three shifts to complete the project. Before the commencement of this exercise, the data processing officers (DPOs) were challenged by the Regional Returning Officer John Itanu, to do a thorough work on the updating of the preliminary rolls. The DPOs were also reminded that the number of the eligible voters that will be casting their votes in this election will depend on how accurately they have entered the names of those that had filled in their claim for enrolment forms. After the completion of data entry, preliminary rolls will be distributed to all constituencies, Council of Elders and District Offices for public scrutiny. Those eligible voters who do not have their names on the common roll will now enroll for inclusion in the final Common roll. It is anticipated that the writs will be issued at the end of March, 2015. The Autonomous Bougainville Government dedicated for the first time the Bougainville Public Service and its public servants in a dedication service today. The dedication service under the theme “A Call to Serve under God’s Leadership” was the initiative of the chief secretary Monovi Amani and was held at the Hutjena Secondary School hall and was attended by all public servants. Pastor Kepsi Elodo who is also the president of the Seventh Day Adventist church in the region flew in last week Friday for the dedication service. When presenting his sermon for the occasion, Pr. Elodo stressed to the public servants that as public servants, they were called to serve God’s people of Bougainville. He challenged them saying the interest of the people of Bougainville must be served because God gave them the strength, wisdom and knowledge so they must do their best. Under the topic “A Call to Serve under God’s Leadership” Pr. Elodo revealed that because God knows our past, present and future, it is appropriate for public servants to work under God’s leadership because God knows the way. He said challenges for this year may be greater than the challenges faced last year but he reminded the public servants that God is interested in them and that he will take care of them. He again challenged the Bougainville public servants saying everything that they do, whether in secret or in public is never hidden from God and if they are not judged by the law of this land, they will be judged by the law of heaven. In conclusion, Pr. Elodo urged and encouraged the public servants to stop the practice of corruption, to remain faithful to their spouses, to attend church services regularly, to read the bible and to pray often because by doing so God will bless them, their families, their work, the Bougainville Public Service and the Autonomous Bougainville Government. After the sermon, the public servants were asked to hold hands and form a big circle as Pr. Elodo offered a prayer of dedication for the public servants, the Bougainville Public Service and the ABG. The Lemanmanu Health Centre in Haku constituency should be relocated according to Chief Hendry Onsa. He told New Dawn Fm in an interview today that there is a land issue going on at the moment and the people of Haku constituency are concerned because the landowners sometimes force the closure of the health centre. He said recently the ambulance belonging to the health centre was taken by a local who claimed that he was not paid by the officers of Lemanmanu health centre for hiring his car. He added that this issue of land ownership has been going on for 20 years now and he is therefore calling on the government and the health department to fast track the relocation of the health centre to Hagogohe. Chief Onsa revealed that an agreement has been signed already by the chiefs of Hagogohe and he is also calling on Dr. Anthony Pumpara to fast track the relocation of the health centre because the people are tired of waiting. He said the proposal for the health centre to be relocated was done fifteen years ago and it has never been implemented. He added that the landowner issue is still there and the only way to solve the problem is to relocate the Lemanmanu health centre to Hagogohe. Bougainville public servants are privileged to be in the position that they are in, says the ABG chief secretary Monovi Amani. Speaking during the Bougainville Public Service dedication service this morning, the head of the Bougainville Public Service stressed that public servants are privileged to be employed by the ABG because if they can look around them, they can see that there are a lot of young, educated and matured Bougainvilleans who are still out on the streets. He added that as public servants, they are so privileged because at the end of two weeks, they get to take home their finances to share with their families. He said they have heard a very important message on servant hood from Pastor Kepsi Elodo and because of the occasion’s importance, the dedication service will be held every year from today. He stressed that it is important that the dedication service be held every year to re-educate the public service which is the machinery for the government of the day. Mr. Amani revealed that the gathering of public servants today is all about putting God first every day under God’s leadership. He said under God’s leadership, there are certain conditions and rules that they as public servants must abide by. He then asked the public servants to honour the government of the day saying if they do so, they will also honour the people of Bougainville.